WASHINGTON, D.C. — The top U.S. military commander in the Africa region has asked the Trump White House for more authority to go after al-Qaeda’s affiliate in Somalia, he said recently. 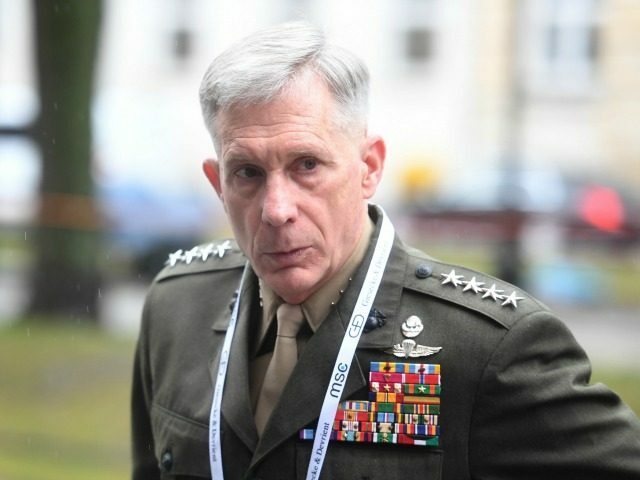 The authority would allow him to make more decisions on targeting the terrorist group, rather than having to seek approval from the Pentagon, which can slow down the process of striking the terrorist group, Africa Command (AFRICOM) Commander Marine Gen. Thomas D. Waldhauser said at a Pentagon briefing on Friday. “If they’re approved and I don’t know what the final product will be, I would say the process might be a little bit streamlined and the authorities are powered down to the [combatant commands] as opposed to coming back up here. I mean, that’s the big significant thing,” he said. Defense Secretary James Mattis approved Waldhauser’s request and forwarded it to the White House in February, according to an article by the Associated Press. Officials told the AP the authorities would allow U.S. Africa Command to launch preemptive airstrikes against al-Shabaab terrorists instead of waiting until they attacked Somali and other friendly forces before striking. They would also allow U.S. special operations forces greater ability to accompany local forces on military operations against al-Shabaab, according to the officials. Devolving authority from the Pentagon to AFRICOM would be “very helpful” in prosecuting al-Shabaab targets, Waldhauser said Friday. “I think the combatant commanders, myself included, are more than capable of making judgments and determinations on some of these targets and I’m well capable and we are all well capable of making those calls,” he said. For example, he said commanders below him made most of the decisions of when to strike during operations that successfully unrooted a growing ISIS presence from Sirte, Libya, this year. Waldhauser said he has not yet received approval for these authorities. His request comes as the Trump administration looks to step up the fight against terrorists all around the globe. It is also currently reviewing a plan on destroying the Islamic State in Iraq and Syria, expected to be finalized around May. Waldhauser assured reporters that if AFRICOM receives these authorities, it would not mean less certainty of who is being struck or targeted on the ground or more civilian casualties. He said it would also not consume more resources than he currently has. He said the threat from al-Shabaab has not changed, but what has changed is that there is a new Somali president, Abdullahi Mohamed Farmajo, who the U.S. can work with. “With the new government there, President Farmajo, we have an opportunity here to move forward. He’s a dual-U.S. citizen. He worked in Buffalo, New York for 10 years or so. He’s got his Master’s Degree from the University of Buffalo. He was a former Prime Minister in Somalia,” Waldhauser said. “He understands how — it’s important to pay the military. He understands what corruption does and does not do for the federal government,” he said.